Popularly used, the term “theory” refers it mere conjecture or guess. The distance between this popular use and the use of the term in systematic study may seem far but in fundamental ways it is not as far as it seems. To illustrate, two common treatments of the term, albeit a fraction of possibilities, will suffice. On the one hand, we have “theory” of the first kind—systematic propositional statements of the nature and characteristics of observed phenomena and the relationships between observed phenomena. This kind of theory—usually referred to as substantive theory—is theory that results from observation. On the other hand, we have “theory” of the second kind—theory that directs observing for it is widely agreed there is no observing, which is not guided by theory. Frequently referred to as metatheory, theory of the second kind is generally assumed to consist of philosophically grounded assumptions about the phenomena and about how to study it. Theory of the first kind is inexorably implicated in theory of the second kind and vice versa. The implications of the juxtanposition of these two kinds of the theory catapults us into a Kuhnian (1962) world where we must accept the idea that different observers whose observing are driven by different theory (type 2) are necessarily operating in different worlds and creating different theory (type I) event while looking in the same direction from the same vantage point. This conclusion appears to undermine theory of the first kind. One can argue that it is at the juncture of these two kinds of theories that we find ourselves buried under mountains of disconnected data and findings driven by mountains of different, sometimes incommensurate, theorizing presented as if theory of the first kind is the only kind operating. Dervin’s Sense-Making Methodology has been explicitly developed based on the premise that it is philosophically anchored methodological consideration, which builds the bridge between these two kinds of theory. In the context of this paper, this viewpoint assumes that methodological explication offers for the systematic study of information seeking and use (and more broadly all communicating processes) an avenue for understanding how scholars move back and forth from theory of the first kind to theory of the second kind within theoretical discourses. Methodological explication can also, if well done, provide a common system of articulation with some degree of independence from the substantive interests of theory allowing the comparison of two substantive theories without having to couch one in terms of the other. This strength allows for comparison between theoretical discourses in a way that the results have a chance of adding up rather than merely piling up. The kind of methodological explication can be called theory of the third kind—theory for methodology. The difficulty in comprehending the role that this approach to methodology can offer is that the term methodology is itself much used and abused. On the one hand, many—mostly those who favor quantitative approaches—collapse methodology into methods and, too frequently, into statistical methods. On the other, many—mostly those who favor qualitative approaches—collapse methodology into philosophic examination. The following privilege theory of the first kind; the latter theory of the second. Few build methodological bridges between. Dervin’s Sense-Making Methodology attempts to begin to be theory of the third kind. The development of Sense-Making began in skeleton from in 1972, was first articulated as Sense-Making in 1983, and continues today (Dervin & Foreman-Wernet, 2003). Sense-Making is proposed as a generalizable approach to thinking about and studying human sense making and sense unmaking in its variant forms. Information seeking and use has been a primary substantive focus, among numerous others, including as examples: health communication, communicating in organizations, media reception, and dialogic communication. Drawing primarily on the intersections of the writings of American and European theorists (of the second kind) in the fields of philosophy, sociology, psychology, education, cultural studies, communication, and feminist, cultural, and postmodern studies, Sense-Making rests on a fundamental set of philosophic assumptions about the nature of human Sense-Making (and sense unmaking) which, in turn, mandates as specific set of methodological moves. These philosophic assumptions have been more fully explicated else where. A subset will be presented here to illustrate how methodology opens up or closes down theoretical possibilities. Sense-Making Methodology mandates attention to a series of what might be called primitive terms—primitive in the sense that they are taken as the given foundation from which extrapolations are derived methodologically to build a bridge to method. In Sense-Making, the primitives include: time, space, horizon, gap, bridge, movement, power, constancy, and change. These primitives are drawn together in the methodology’s central metaphor, illustrated in Figure C2.I. The metaphor is designed as a highly generalizable “microscope” guiding the observation of communicating (for purpose here, information seeking and use). 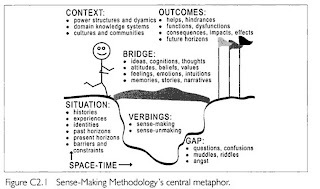 Sense-Making mandates that communicating be conceptualized as gap bridging—not in the purposive, problem solving sense (although that is one subset of all gap-bridgings) but in the sense of gap-bridging as a mandate of the human condition. Each new moment in time-space requires another gap –bridging step regardless of whether that step is manifested as habitual and unconscious; capricious and accidental; or invented and planned. Gap-bridging is posited as potentially changeable across time-space but in given time-space moments arrangements, experiential horizons, and flows of power/energy. As a person moves from time-space moment to time-space moment, gap-bridge is seen as both potentially responsive and potentially impervious it changing conditions. Two major consequences of carrying these methodological assumptions into method will be pursued here. This first is the challenge Sense-Making offers to research design that study information seeking and use as only habitual. In method, such studies tap into “usual” behaviors asking informants, for example, ‘How often do you use x?” or “When was the last time you used y?” Such studies also typically predict information seeking and use based on characteristics of users assumed to be constant across time-space (e.g, demographic and personality characteristics) or characteristics of situations assumed to be constant to all who experience these situations (e.g., domain or task). A study informed by Sense-Making does not challenge these research design as wrong but rather as “not enough” Sense-Making mandates attention to information seeking and use as both potentially constant and potentially changeable across time-space. Likewise, it mandates attention to the conditions under which one would expect one or the other or both. As a methodological frame, then, Sense-Making proposes to provide an avenue for pursuing traditional studies of information seeking use and simultaneously opening up alternatives. The mandate to study time, space, and movement, for example, allows for the possibility of conceptualizing information seeking and use as habitually patterned and/ or situationally/temporally patterned. By constructing interviewing method that elicit informant reports of barriers and facilitators of information seeking and use, Sense-Making studies have been able to identify what is called the “render unto Caesar” hypothesis as one propositional generalization about information seeking and use. This proposition state that when external forces (e.g., such as economics) constrain information seeking and use alternatives, making some options less possible, then demographic attributes of users (conceptualized in Sense-Making as indices of societally imposed structural conditions) will predict better. When, however, external forces do not constrain (e.g., as when users evaluate information systems), the situational conditions of use will predict better. Again, a study informed by Sense-Making does not reject the demographic prediction. Rather it mandates attention to enlarged possibilities. In the broadest sense, then, it can be said that methodology is the reflexive examination of how assumptions inscribe methods that open up research to some possibilities and constrain others. When interviewing method, for example, asks users for usual information seeking behavior, method closes off the possibility of observing whether the “usual” is habitual, average, or caprice. It also closes off the possibility of observing information seeking and use patterns that change in response to changing situational conditions. To often, the methodological premises—or primitives—lurking behind social scientific research methods are unstated, buried in long histories of intragenre discourse. Unstated, or not, however, the primitives operate to both constrain and enable possible research attentions. 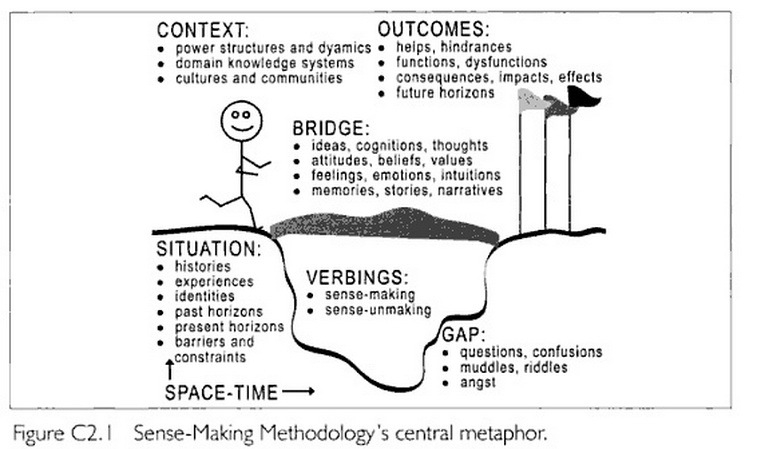 What Sense-Making Methodology has attempted to do is build an explicit methodological bridge between method and the possibilities for constructing alternative theories of information seeking and use. Sense-Making assumes that theories of type 3 (theory for methodology) are required for reflexively addressing how theories of type 1 (substantive theories) are enabled and constrained by theories of type 2 (philosophical assumptions) and vice versa.